Portable Handheld Fan, Mini Personal Cooling Fan, Pocket Fan, Jiaderui Rechargeable Battery Operated Quiet Desk Fans, Strong Wind, for Kids, Adult, Outdoor Camping, Travel, Car(2 Speeds, Green) by Jiaderui at Kids Home Warehouse. MPN: LN-80. Hurry! Limited time offer. Offer valid only while supplies last. All occasion you can use, perfect personal handheld mini fan - Outdoor indoor. You can put the mini fan into your pocket and carry it to anywhere. All occasion you can use, perfect personal handheld mini fan - Outdoor indoor. Two hours quick charge, keep working 2-4 hours, low power consumption. USB rechargeable, can easily be charged by all USB-enabled devices, such as USB charger, Laptop, Computer, Power bank etc. How to use it? 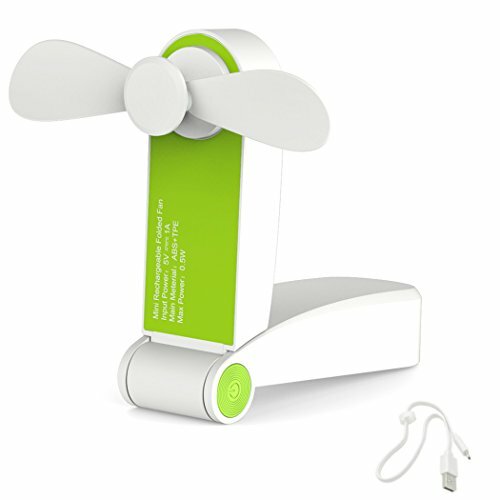 1: Fully charged this mini pocket fan for the first use, it takes about 2 hours to active the battery. 3: Following folding steps to open the fan, press the round button on the right side to switch Low wind / High wind / Off it. 5: Please be cautious while using it, in case to being scratched by blades. Do not for children to play alone; children need to be used under adult supervision. Do not put the product in moisture, high temperature, blazing sun environment. Please stay away from face and eyes avoiding hair, rope, or necklace involved in the fan. 【Small but powerful - 2 speeds】 You can put the mini fan into your pocket and carry it to anywhere. Don't worry about the power of the fan, it's a mini handheld fan, but has the same power as some big handheld fans, can meet most of your cooling demand, and suitable for kids and adults. It's the most powerful mini fan we found. 【 Rechargeable & energy saving】 Two hours quick charge, keep working 2-4 hours, low power consumption. USB rechargable, can easily be charged by all USB-enabled devices, such as USB charger, Laptop, Computer, Power bank etc. 【Safe to use】 Hands friendly, high grade TPE blades, very soft and cozy, do not worry about would hurt your hands. High material quanlity, polish ABS solid structure, neat and sleek, safe to children. Blades hidden under the cover, Well Protected! 【New foldable & portable design】 Compact size, Multi segment foldable. Unique 0° to 270° foldable design, can be held by hand or put on desk, satisfy most of your needs. You also can fold it in half length, and put it into your pocket, purses and bags. Perfect for outdoor activities, travelling, camping, picnic, beach, hiking backpacking; Great choice for Car, office, school, desktops, bedside table. 【Quiet and stable】 It's a super quiet and stable mini handheld fan. Adopting an optimized motor, premium Ultra-Quiet motor offer strong wind, with unique noise reduction. Note: Please note that children under age of 7 are forbidden to operate it. Our products have to pass strict test, inspection and packaging before they are sent off. If any problem, please feel free to contact us and we will offer you the best service. If you have any questions about this product by Jiaderui, contact us by completing and submitting the form below. If you are looking for a specif part number, please include it with your message.